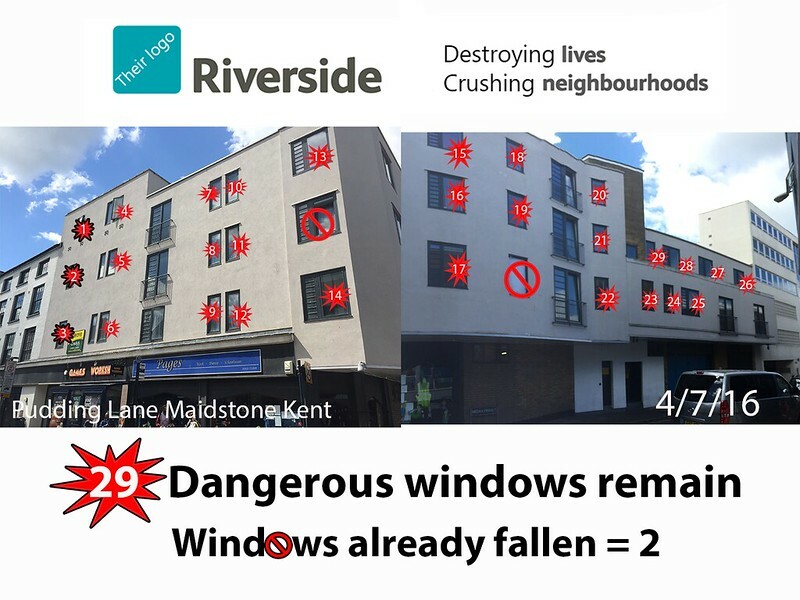 UPDATE to original article – ITS NOW 16th June 2017, TWO windows fallen so far, and MANY HEALTH AND SAFETY issues including non working Fire Doors within the building not corrected by Riverside. Maidstone Borough Council still dragging their heals – after an inspection listing MANY health and safety issues Riverside were told to make corrections within a defined time limit! This has been exceeded by atleast 8 months. But when STARC chased MBC to enforce their inspection deadline – tumble weeds were their response – TOTAL INACTION. Riverside bought Pudding Lane April 2015 – promised the earth and did nothing. A second window fell out November 27th 2015 – NO REPAIR TODATE 567 days or 1.5 years! Their response? “SCREW THE WINDOWS SHUT” please read on…. “arrange all windows to be screwed shut”, pardon? I hear you say. Yes you heard correctly – apparently the safety of tenants is NOT a priority! Tenants are in an uproar and in shear dismay – One STARC tenant said “How are we supposed to escape if there is a fire?” and another said, “How are my children going to breath during the summer months? There isn’t any ventilation!“. What on earth are Riverside thinking? Evidently of themselves and not about the Tenants. Some of you will know, that we have had some issues with the windows facing the street… These specialists have since carried out surveys and have determined that the windows are not safe to open. PreviousSubject Access Request (SAR) template – when you need to know!